In a blog post published today, the Pebble team informs that the first batch of Pebble smartwatches have been sent out to the very first backers, although the iOS app isn’t yet available in the App Store as it is under review. This means iOS users will be limited to do notifications and Music control, until the app fully complies with Apple’s App Store rules, which will enable neat features like watchface and OS updates. The Android app, on the other hand, will go live on Google Play on Thursday January 24. Seems like the Pebble team has accidentally sent out more address confirmation emails than available Pebbles, which means some people who got an address confirmation email won’t get tracking numbers, until their Pebble is shipped. 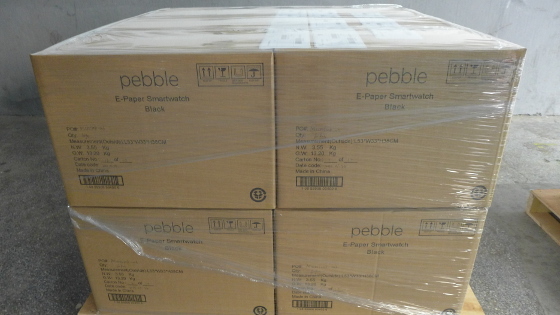 The first Pebble batch includes a bit less than 500 units, which is below the team’s expectation, but more is expected to ship soon. To track their shipping progress you can visit a website they created: www.ispebbleshipping.com, but they are working on adding shipment tracking to accont.getpebble.com as well. Considering that they manufacture around 800-1,000 smartwatches per day, it will take some time to reach their full capacity. There is an up to 7 days lag between Pebble coming off the assembly line and arriving to Hong Kong, the distribution center fulfilling shipments to any country that isn’t US. The Pebble smartwatch cost $150 and is available for pre-order in multiple colours.